Anne Louise Germaine de Staël (April 22, 1766 – July 14, 1817), commonly known as Madame de Staël, was a French-speaking Swiss author living in Paris and abroad. Although not a particularly gifted author herself, she was a significant literary figure who influenced literary tastes in Europe at the turn of the eighteenth and nineteenth centuries. In Coppet, and later in Paris, she developed a salon, a group of literary figures, friends and fellow refugees that gathered around her. She also engaged in a famous confrontation with the Emporer Napoleon Bonaparte, leading to her exile until the restoration of the Bourbon dynasty, when she returned to Paris. She was one of the founders of Romanticism in France. In art and literature Romanticism stressed strong emotion as a source of aesthetic experience. Underlying the specific roots of Romanticism is the development of the importance of the human personality—the individual. The rationality of the Enlightenment was still focused on general truths. Romanticism focused for the first time on the "individual." Born Anne Louise Germaine Necker in Paris, France, she was the daughter of the prominent Swiss statesman Jacques Necker, who was the Director of Finance under King Louis XVI of France, and Suzanne Curchod, almost equally famous as the early love of Edward Gibbon, as the wife of Necker himself, and as the mistress of one of the most popular salons of Paris. Between mother and daughter there was, however, little sympathy. Mme Necker, despite her talents, her beauty and her fondness for philosophic society, was strictly decorous, somewhat reserved, and disposed to carry out in her daughter's case the rigorous discipline of her own childhood. The future Mme de Staël was from her earliest years a coquette, passionately desirous of prominence and attention. There seems moreover to have been a sort of rivalry between mother and daughter for the chief place in Necker's affections, and it is not probable that the daughter's love for her mother was increased by the consciousness of her own inferiority in personal charms. Mme Necker was of a most refined though somewhat lackadaisical style of beauty, while her daughter was a plain child and a plainer woman, whose sole attractions were large and striking eyes and a buxom figure. She was, however, a child of unusual intellectual power, and she began very early to write though not to publish. She is said to have injured her health by excessive study and intellectual excitement. But in reading all the accounts of Mme de Staël's life which come from herself or her intimate friends, it must be carefully remembered that she was the most distinguished and characteristic product of the period of sensibility—the singular fashion of ultra-sentimentalism—which required that both men and women, but especially women, should be always palpitating with excitement, steeped in melancholy, or dissolved in tears. Still, there is no doubt that her father's dismissal from the ministry and the consequent removal of the family from the busy life of Paris, were beneficial to her. During part of the next few years they resided at Coppet, her father's estate on the Lake of Geneva, which she herself made famous. But other parts were spent in travelling about, chiefly in the south of France. They returned to Paris, or at least to its neighborhood, in 1785, and Mlle Necker resumed literary work of a miscellaneous kind, including a novel, Sophie, printed in 1786, and a tragedy, Jeanne Grey, published in 1790. When it came to marriage, her want of beauty was compensated by her fortune. But her parents are said to have objected to her marrying a Roman Catholic, which, in France, considerably limited her choice. There is a legend that William Pitt the Younger thought of her; the somewhat notorious lover of Mlle de Lespinasse, Guibert, a cold-hearted coxcomb of some talent, certainly paid her addresses. But she finally married baron Erik Magnus Staël von Holstein, who was first an attaché of the Swedish legation, and then minister. For a great heiress and a very ambitious girl the marriage scarcely seemed brilliant, for Staël had no fortune and no very great personal distinction. A singular series of negotiations, however, secured from the king of Sweden a promise of the ambassadorship for twelve years and a pension in case of its withdrawal, and the marriage took place on January 14, 1786. The husband was 37, the wife 20. 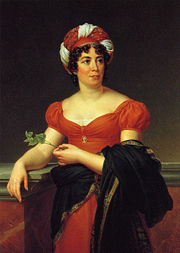 Mme de Staël was accused of extravagance, and latterly an amicable separation of goods had to be effected between the pair. But this was a mere legal formality, and on the whole the marriage seems to have met the views of both parties, neither of whom had any affection for the other. They had three children; there was no scandal between them; the baron obtained money and the lady obtained, as a guaranteed ambassadress of a foreign power of consideration, a much higher position at court and in society than she could have secured by marrying almost any Frenchman, without the inconveniences which might have been expected had she married a Frenchman superior to herself in rank. Mme de Staël was not a persona grata at court, but she seems to have played the part of ambassadress, as she played most parts, in a rather noisy and exaggerated manner. Then in 1788 she appeared as an author under her own name (Sophie had been already published, but anonymously) with some Lettres sur J. J. Rousseau, a fervid panegyric which demonstrated evident talent but little in the way of critical discernment. She was at this time, and indeed generally, enthusiastic for a mixture of Rousseauism and constitutionalism in politics. She exulted in the meeting of the states general, and most of all when her father, after being driven to Brussels by a state intrigue, was once more recalled and triumphantly escorted into Paris. This triumph however was short-lived. Her first child, a boy, was born the week before Necker finally left France in disgrace; and the increasing disturbances of the Revolution made her privileges as ambassadress a very important safeguard. She visited Coppet once or twice, but for the most part in the early days of the revolutionary period she was in Paris taking an interest in and, as she thought, a part in the councils and efforts of the Moderates. At last, the day before the September massacres, she fled, befriended by Manuel and Tallien. Her own account of her escape is, as usual, so florid that it strains credulity, provoking the question whether she was in any real danger. While probably in no direct danger from harm, she nonetheless had generously strained the privileges of the embassy to protect some threatened friends, and this was a serious matter. She then moved to Coppet, and there gathered round her a considerable number of friends and fellow-refugees, the beginning of the salon which at intervals during the next 25 years made the place so famous. In 1793, however, she made a visit of some length to England, and established herself at Juniper Hall, Mickleham in Surrey as the center of the Moderate Liberal emigrants: Talleyrand, Louis, comte de Narbonne-Lara, Arnail François, and Marquis de Jaucourt among others. There was a scandal about her relations with Narbonne; and this Mickleham sojourn (the details of which are known from, among other sources, the letters of Fanny Burney) remains shrouded in some mystery. In the summer, she returned to Coppet and wrote a pamphlet on the queen's execution. The next year her mother died, and the fall of Maximilien Robespierre opened the way back to Paris. Her husband (whose mission had been in abeyance while he remained in Holland for three years) was accredited to the French republic by the regent of Sweden; his wife reopened her salon and for a time was conspicuous in the motley and eccentric society of the Directory. She also published several small works, chief among them an essay Sur l'influence des passions (1796) ("On the influence of the passions") and another Sur la litérature considéré dans ses rapports avec les institutions sociales (1800) ("Literature and it relations with the social institutions"). It was during these years that Mme de Staël was of chief political importance. Narbonne's place had been supplied by Benjamin Constant, whom she first met at Coppet in 1794, and who had a very great influence over her, as in return she had over him. Both personal and political reasons threw her into opposition to Bonaparte. Her own preference for a moderate republic or a constitutional monarchy was quite sincere, and, even if it had not been so, her own character and Napoleon's were too much alike in some points to allow them to be close. For some years, however, she was able to alternate between Coppet and Paris without difficulty, though not without knowing that the First Consul disliked her. In 1797, she separated formally from her husband. In 1799 he was recalled by the king of Sweden, and in 1802 he died, duly attended by her. Besides the eldest son Auguste Louis, they had two other children—a son Albert, and a daughter Albertine, who afterwards became the Duchesse de Broglie. The exact date of the beginning of what Mme de Staël's admirers call her duel with Napoleon is not easy to determine. Judging from the title of her book Dix annees d'exil, (Ten Years in Exile) it should be put at 1804; judging from the time at which it became clear that she and the first man in France were not likely to get along, it might be put several years earlier. It displeased Napoleon no doubt that Mme de Staël should show herself recalcitrant to his influence, but it probably pleased Mme de Staël to quite an equal degree that Napoleon should apparently put forth his power to crush her and fail. If Mme de Staël had really desired to take up her parable against Napoleon seriously, she need only have established herself in England at the peace of Amiens. But she lingered on at Coppet, constantly yearning after Paris, and acknowledging the desire quite honestly. In 1802, she published the first of her really noteworthy books, the novel of Delphine, in which the femme incomprise was in a manner introduced to French literature, and in which she herself and not a few of her intimates appeared in transparent disguise. In the autumn of 1803, she returned to Paris. Had she not displayed such extraordinary anxiety not to be exiled, it remains an open question whenter Napoleon would have exiled her or not; but, as she began at once appealing to all sorts of persons to protect her, he seems to have thought it better that she should not be protected. She was directed not to reside within forty leagues of Paris, and after considerable delay she determined to go to Germany. She journeyed, in company with Constant, by way of Metz and Frankfurt to Weimar, arriving there in December. There she stayed during the winter and then went to Berlin, where she made the acquaintance of August Wilhelm Schlegel, who afterwards became one of her intimates at Coppet. From there she travelled to Vienna, where, in April, the news of her father's dangerous illness and shortly thereafter of his death (April 8) reached her. She returned to Coppet, and found herself its wealthy and independent mistress, but her sorrow for her father was deep and troubling. She spent the summer at the chateau with a brilliant company; in the autumn she journeyed to Italy accompanied by Schlegel and Sismondi, and there gathered the materials of her most famous work, Corinne. She returned in the summer of 1805, and spent nearly a year in writing Corinne; in 1806 she broke the decree of exile and lived for a time undisturbed near Paris. In 1807, Corinne, the first aesthetic romance not written in German, appeared. It is a picaresque (picturesque) tour couched in the form of a novel. The publication was taken as a reminder of her existence, and the police of the empire sent her back to Coppet. She stayed there as usual for the summer, and then set out once more for Germany, visiting Mains, Frankfort, Berlin, and Vienna. She was again at Coppet in the summer of 1808 (in which year Constant broke with her, subsequently marrying Charlotte von Hardenberg) and set to work at her book, De l'Allemagne (From Germany) which occupied her for nearly two years, during which she did not travel often or far from her own house. She had bought property in America and thought of moving there, but she was determined to publish De l'Allemagne in Paris. Straining under French censorship, she wrote to the emperor a provoking and perhaps undignified letter. Napoleon’s mean-spirited reply to her letter was the condemnation of the whole edition of her book (ten thousand copies) as not French, and her own exile from the country. She retired once more to Coppet, where she was not at first interfered with, and she found consolation in a young officer of Swiss origin named Rocca, twenty three years her junior, whom she married privately in 1811. The intimacy of their relations could escape no one at Coppet, but the fact of the marriage (which seems to have been happy enough) was not certainly known till after her death. The operations of the imperial police in regard to Mme de Staël are rather obscure. She was at first left undisturbed, but by degrees the chateau itself became taboo, and her visitors found themselves punished heavily. Mathieu de Montmorency and Mme Recamier were exiled for the crime of seeing her. She at last began to think of doing what she ought to have done years before, withdrawing herself entirely from Napoleon's sphere. In the complete subjection of the Continent which preceded the Russian War this was not as easy as it would have been earlier, and she remained at home during the winter of 1811, writing and planning. On May 23, she left Coppet almost secretly, and journeyed by Bern, Innsbruck and Salzburg to Vienna. There she obtained an Austrian passport to the frontier, and after some fears and trouble, receiving a Russian passport in Galicia, she at last escaped from Napoleonic Europe. She journeyed slowly through Russia and Finland to Sweden, making some stay at St Petersburg, spent the winter in Stockholm, and then set out for England. Here she received a brilliant reception and was much lionized during the season of 1813. She published De l'Allemagne in the autumn but was saddened by the death of her second son Albert, who had entered the Swedish army and fell in a duel brought on by gambling. She undertook her Considerations sur la revolution francaise, and when Louis XVIII was restored, she returned to Paris. She was in Paris when the news of Napoleon's landing arrived and at once fled to Coppet. A story circulated that she approved of Napoleon's return, but there is no direct evidence of it. Still, the conduct of her close ally Constant may be quoted in its support, and it is certain that she had no affection for the Bourbons. In October, after Waterloo, she set out for Italy, not only for the advantage of her own health but for that of her second husband, Rocca, who was dying of consumption. Her daughter married Duke Victor de Broglie on February 20, 1816, at Pisa, and became the wife and mother of French statesmen of distinction. The whole family returned to Coppet in June, and Lord Byron now frequently visited Mme de Staël there. Despite her increasing ill-health she returned to Paris for the winter of 1816-1817, and her salon was much frequented. But she had already become confined to her room if not to her bed. She died on the July 14, and Rocca survived her little more than six months. Mme de Staël occupies a singular position in French literature. The men of her own time exalted her to the skies and the most extravagant estimates of her (as the greatest woman in literary history, as the foundress of the romantic movement, as representing ideas, while her contemporary Chateaubriand only represented words, colours, and images and so forth) are to be found in minor histories of literature. On the other hand, it is acknowledged that she was soon very little read. No other writer of such eminence is so rarely quoted; none is so entirely destitute of the tribute of new and splendid editions. History of "Anne Louise Germaine de Stael"